Ahh, this tangled web. 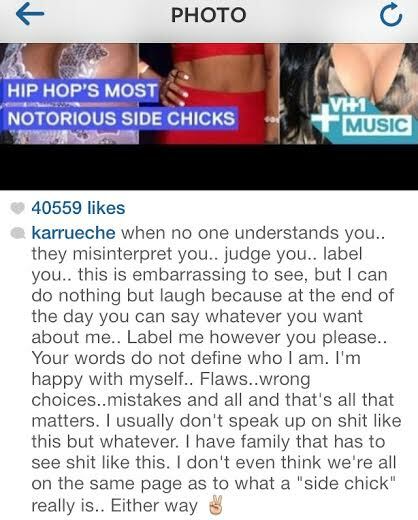 Unless you’ve been living under a boulder, you know that Breezy had an affair with aspiring model (aren’t they all) Karrueche while he was with Rihanna. Then, he and Riri broke up, and he wifed up Karrueche — but then promptly cheated on her with Rihanna, and then got back together with Tran. Rinse, repeat. The love triangle has inspired several years of bitter twitter battles between the girls (Rihanna actually referred to the half-Vietnamese stunner as a “rice cake” in her duet with Brown, “Birthday Cake,” and then tweeted a pic of a rice cake wearing shades and gold hoop earrings), as well as beef between their two entourages — but Brown can’t seem to quit either of them. In a confessional video he released in 2012, he said as much. “Is there such a thing as loving two women?” Yeah, dude, but for your own sanity, just pick one. Other ladies that made the list are; Lil Kim (Notorious BIG), Leyla Ghobadi (Kanye West), Sarah Chapman (P-Diddy) and 6 others. The other ladies are yet to react but one thing I have realized doing Pop Culture analysis is that if they do, it will be via social media. I kinda understand where K-Tran is coming from. It can be very annoying being tagged as what you do not see yourself as. Swerve! So do you think this list is fair and judging from her reaction do you think this will put an even bigger strain on her relationship with Chris Brown? Next Jay Z Splits with Yet Another Business Partner? 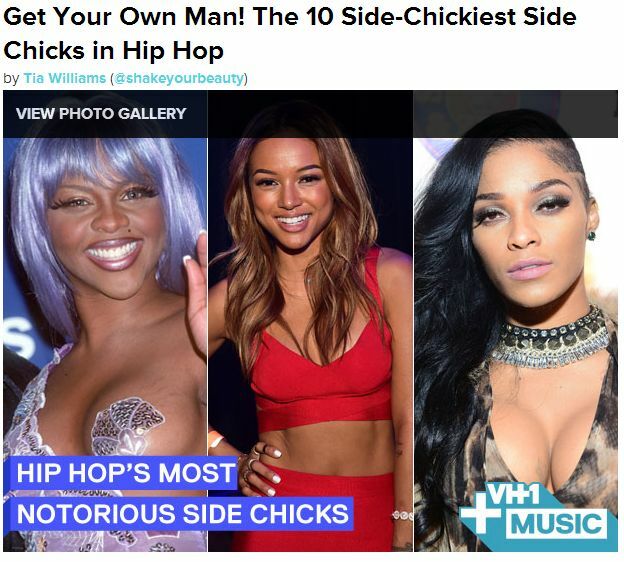 If you’re going to compile a list of people that you think are “side chicks” I think it would be best to make sure that your list is right, this is a rule for any list honestly. This is a crazy situation but Tia Williams (The Blogger) was dead wrong on that post.